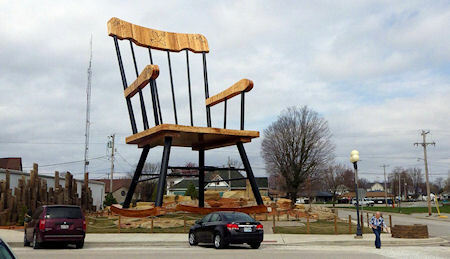 At just over two square miles and with less than 3,000 inhabitants, the town of Casey in Illinois might be among the smaller towns of the US, but it's home to some of the biggest things in the world. These include a wind chime, a rocking chair, knitting needles and a crochet hook, a mailbox, a pitchfork, a golf tee, a pair of wooden shoes, a coin, a birdcage, a yardstick, a pencil, a ear of corn, saguaro cactus and many more. Maybe you are too modest to slip in a mention of the tallest chair in Europe - The Big Chair in Oirschot?